PROSPECT — Mayor Robert Chatfield has spent more than 40 years leading the town, and the Republican has no plans to slow down. 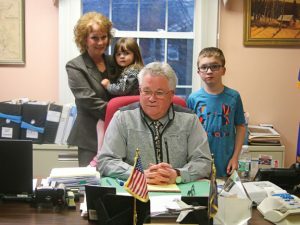 “I am here to tell you that I will be involved in a local election this year and I will be asking the (Republican) Town Committee for their endorsement at the proper time,” said Chatfield, 75, from the mayor’s office in Town Hall on April 9 with his family by his side. Chatfield was first elected mayor in 1977 and has held the seat since. He is believed to be the longest serving chief elected official in the state. Chatfield said he has proven himself over the last four decades, adding he has accomplished a lot during his time in office. “I am going to running on my record,” Chatfield said. Chatfield said that record includes creating Hotchkiss field, supporting the construction of Woodland Regional High School, and bringing water lines into the town. Every town and public building in the center of Prospect has access to the water line now, he said. Chatfield said there are still projects he wants to accomplish, including an addition to the Prospect Senior Center. “I am not finished doing what I would like to do for the town,” Chatfield said. Republican Town Committee Chairman Nazih Noujaim said Chatfield has done a great job over the years keeping the town running on a tight budget. Chatfield, a U.S. Air Force veteran, first started in politics as a constable before being elected to the Town Council in 1973. Chatfield said the town has grown over the years, but everyone is still friendly. “I would like to thank the taxpayers for their support and confidence in me. The town has grown up with me and I’ve grown up with the town. I enjoy my job,” Chatfield said.